In this walk with God I have had ups and downs. I have been well and I have been sick. My question is why do other Christians think I have done something wrong to be sick? Currently I am walking through an illness, and so are members of my family. I did not ask to be sick. Neither did my family. I do not want to be sick. I don’t know why I am am battling this illness. But I do trust that somehow, someway God will get the glory. And here again, Jesus heals the sick. He can even raise the dead if it comes to that! God never said there would be no sickness. 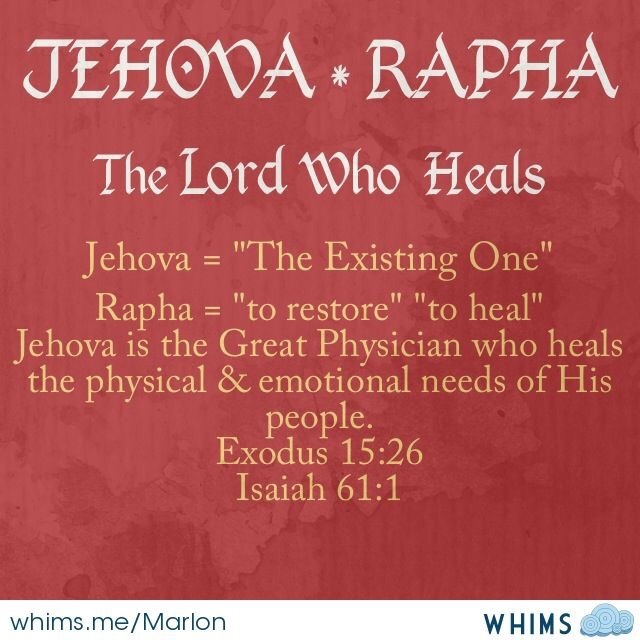 One of God’s Names is Jehovah-Rapha, “the Lord who heals you”. To me, that means there is sickness out there. Jesus came to heal the sick and bind up the broken-hearted. He came to destroy the works of the Devil. Yes, we live in a broken world. There is sin and sickness everywhere. Even in the Church. But let us not treat the sick as lepers. Let us not be an Old Testament Church and stone them. Let us be the Hospital that God had called us to be and exercise the Authority God gave us to cast out the sickness, not the person. I am blessed. Even though I was in the hospital last week both Pastors and their wives came to pray with me and anoint me with oil. Thank you Jesus! God bless Pastor Jeff and Carmen and Pastor Mike and Dee of Janesville Apostolic Ministries! Let us pray for one another – and not shame the sick. Pray for me my friends. And for my family. I pray the Lord restores you and yours, in Jesus Name. To God be the glory. Posted in Deliverance, faith, God, Healing, Hope, Kingdom Authority, Religion and Spirituality, Spirituality and tagged God, healing, resore, sick, sickness. Bookmark the permalink. Dear Diana, you are so right. In fact, He said we would have troubles. Yet He knows of them, and keeps us in His heart. Sending up a healing prayer of comfort now for you and your family, sweet sister. May the Holy Spirit take this prayer straight to the Father; may He wrap His healing hands around you all. I lift this prayer in the name of our Savior Jesus Christ. Thanks for sharing this message, Diana. I’m thankful God made our blogs cross paths; I am blessed and enlightened by your words. I’m sorry to hear you’ve been sick….Please know that you are now in my prayers. It seems like there are so many that have been so sick lately. Praying for God to restore you and yours! I really love this line from your writing: “But I do trust that somehow, someway God will get the glory.” Amen!